Artists, rarely do any group inspire so many opinions and emotions. Some deride them as charlatans living in a fantasy world while some are in awe of their creative prowess. They come across as living Bohemian lives. Too often have movies been made to show them as mythical and misunderstood creatures. I felt disappointed with these movies since they celebrated the artist but never quite celebrated their art. There was an element of fetishism in it. “Tatsumi”, released in 2011 and directed by Erich Khoo does not fall into this trap. It is based on the manga memoir, “A Drifting Life”, by Japanese manga artist, Yoshihiro Tatsumi. Most of us are aware of what manga are. They are comic books usually aimed at teenagers or younger. Gekiga is an alternative style of manga which is aimed at adults. Yoshihiro Tatsumi is the Tao of gekiga. Since the movie is based on Tatsumi’s memoir, the protagonist, for most of the movie, is Tatsumi himself. The film opens with the funeral of Osamu Tezuka; an artist Tatsumi deeply admired from childhood. He goes on to talk about Tezuka’s influence, later in the movie. After the funeral scene, we are introduced to one of Tatsumi’s gekiga, called Hell. Here, we see a photographer become famous when he takes a photo of the outline of a mother and son on a wall in the city of Hiroshima. This outline was created after the explosion of the atom bomb. The photograph becomes a rallying cry against the use of nuclear weapons. To the photographer’s horror, he finds out that the son is still alive and the outline was that of his friend trying to kill the mother. He had previously hatched a plan to have his mother killed, so that he could sell the house and live a luxurious life. The son tries to blackmail the photographer, but ends up getting killed by him. The plot then shifts to a young Tatsumi talking about his childhood and his jealous older brother, Okichan. He starts drawing manga since the age of twelve, and builds his skill to a point where he gets interviewed by a reporter. The newspaper also introduces him to his idol, the famed manga artist, Osamu Tezuka. Soon, he starts earning enough to help his family. When he grows older, he starts working for a magazine and moves in with friends. In between, there are other manga shown, as we slowly come to know how the precocious boy became one of the best manga artists. These include “Beloved Monkey”, “Just A Man”, “Occupied” and “Goodbye”, all of which were created by Tatsumi. There are several points of interest in this movie. The first and most important one is that it offers a wonderful window into Japan’s progression from a war-ravaged country into an economic powerhouse. 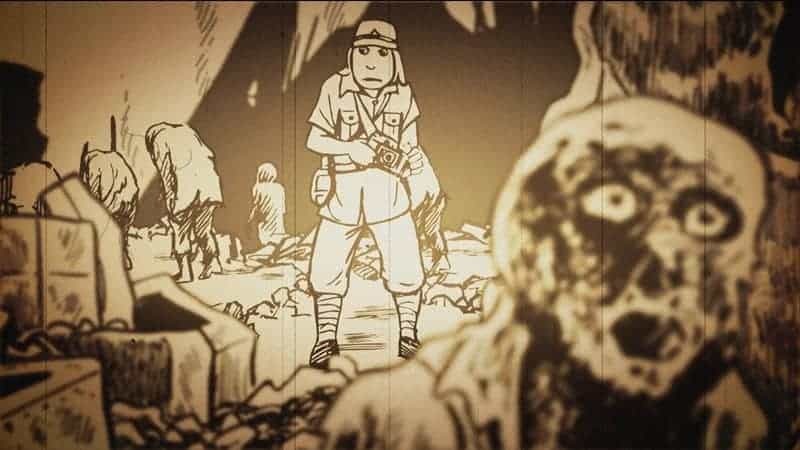 Barring “Beloved Monkey”, each of the characters was a former member of the Japanese Army. It also shows the loss of innocence of a society which was drunk on nationalism. Manga, at the time, were aimed towards children. Tatsumi wanted to change this and portray reality. Something that adults could relate to. He wanted to show the rot inside Japanese society. Each of the characters in the manga shown in the movie feels isolated. They are sensitive creatures who have been reduced to doing whatever necessary to survive, due to tough circumstances. Yet, the spark to get out and do something, to live their life is still there. As an adult who has dreamed, this is so relatable. Gekiga shows life in its naked ugliness. The film is a great introduction to gekiga as well. Tatsumi’s argument about wanting to show the reality, (and I am paraphrasing here) “why do we not show blood when samurais are fighting?” Having recently watched anime like “Berserk”, I can understand where this influence stems from. While the scenes can be gory, overly sexualised, or uncomfortable in any way, it is the naked truth. 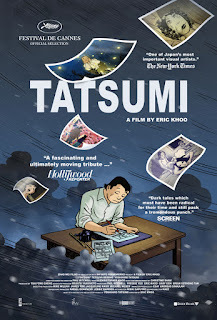 From a more technical perspective, “Tatsumi” is a brilliantly made animated movie. The animation style is the same as that of gekiga. So, the audience gets a good taste of the artwork to be expected should they choose to read one. Their intermittent appearance of Tatsumi, in between the memoirs, keeps changing the pace. Given that each of the stories is different and have their own unique selling points, it is almost like watching a TV series. It also helps us get a peek inside the mind of an artist. There are two scenes which made a distinct impression on me. The first is when Okichan, in a fit of jealousy, tears apart Tatsumi’s artwork and Tatsumi runs away and cries in a field. He does not wish to make manga again. As he lies there, he is surrounded by fireflies and finds renewed strength to move on. The scene is done excellently. The other scene occurs towards the end of the movie. Tatsumi is now an old man and in what appears to be a bookstore. He comes across characters from each of his works and they all nod or wave at him in recognition. “Tatsumi” is a deeply personal work. Anyone who has spent hours working on a piece of art, honing their skill, will surely relate to this movie. There is a touch of justice when we see an old Tatsumi creating art. It hooks the audience in and takes them for a ride. It is not just a journey into who Yoshihiro Tatsumi is, but also into who we are.